This is how to install cryptkeeper and set it up for usage. I'm still using this backup script to back up ~/cron/ as its got my reinstall.sh script in which I need for installing, so it seems sensible to keep access to it. When using urxvt the title-bar would always be underneath the top panel, with no way of changing it. I was able to get round it using xterm but that meant that I couldn't use the tabs that was programmed into 'urxvt'. As this is such a large subject I've split it into three, and this part just deals with the menus, the ones you get if you 'Right+Click' with your mouse on the desktop. In my usermenu in Part 2 you'll see that I have these two lines in the Quit submenu. I've just started using skippy-xd which is a full-screen task-switcher for X11. You can get it from https://code.google.com/p/skippy-xd/downloads/list but it is 'vintage software' being released in 2011! Go to ’Firefox Themes’ https://addons.mozilla.org/en-US/firefox/addon/lucky/ and have a look at the themes and find one you like. 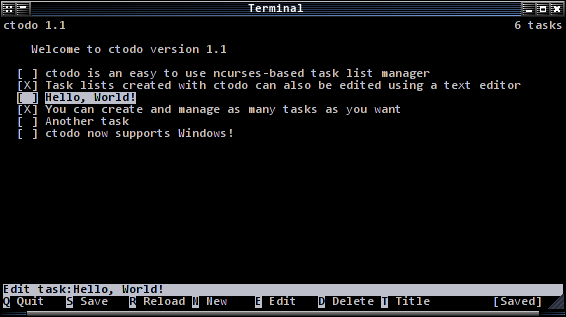 One programme that I use everyday is ctodo which is to be found at https://github.com/Acolarh/ctodo ,and its a simple ncurses-based task list manager. I've recently become a convert to the use of aliases which make life so much simpler and more enjoyable. Its so nice to just enter into a terminal upgrade and it executes the command sudo apt-get upgrade! There are a lot of radio stations on the internet and I have made my list from various sources, starting with those from the programme Radio Tray. I've also included those from SomaFM, and the BBC for those in the UK. I have a new computer which means that I've had to upgrade my conkyrc and conky setup. And you'll see various hidden things about your mobile. This script adds a password to the PDFs. I've used sudo updatedb and then locate foo to find things on my system, and that worked for some things but not others. I needed something more powerful, enter ........... Grep! I have been a fan of Tony Buzan's mind-mapping for many years, and have used several programmes for it, primarily kdissert and now freemind. A part of my plan is to backup all my mp3's to dvd, and then maybe even delete some of them such that I can play them from the dvd I've been busy converting from flac to mp3 and wav to mp3. C-x C-v calls ’find-alternate-file’ which means that it reads a different file. C-x i calls ’insert-file’ which means to insert a file at the cursors position. The following short cuts will focus primarily on open windows. This combination cycles through the currently open windows. This is handy when you have a lot of windows open and you constantly are moving from one to another. Vnstat has long been a favourite of mine, and I've used it for many years, but I've just learnt that when you set it up with vnstat -u -i eth0 run as root, that you must then reboot for it to have any effect and start recording. I've recently started backing up my commercial DVD's to my hard drive, and I'm tending to use HandBrake for it. So far it produces a nice compact m4v file, but I've yet to see the fruits of my intensive labours with it. And its soooo slow!